About Great Guana Cay, Abaco Bahamas. A Vacation Guide. Great Guana Cay is the first island you come to south of Noname Cay and the Whale Cay Passage. Guana's reef strewn ocean beaches that line its 5.5 miles of coast are reputedly the most beautiful in all the Abacos. The white sand beach is bathed in waters of every shade of blue, aqua marine and turquoise. At its northwestern point is Bakers Bay, a lovely crescent mile long beach. 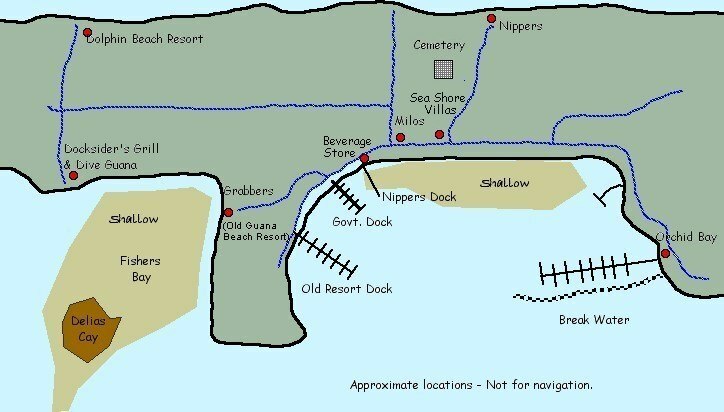 Disney used to use Bakers Bay as their "out island" and tendered guests ashore. Sea conditions at Whale Cay often made mooring treacherous and Disney eventually pulled out. Disney still has their island in the the Abacos, although it's nowhere near the cays and more importantly has no impact on this region. Today this the home of the The Bakers Bay Club. Its one of two or three getaway resorts in the Abacos for the rich and famous. It consists of a golf course, 100 plus slip marina and a multitude of villas on the property. I, like many of the islanders worried that this mega-undertaking will kill the fragile environment of Guana Cay who's reefs are world renowned. A Rental homes or villa is by invitation only and where your stay will be upwards of $100,000 a week plus another $100,000 for food, drink and amenities. The celebs have been pouring in (Jennifer Lawrence spring 2016) to play here protected from the paparazzi by an over zealous cadre of private police. Tread lightly if you go and are not invited. Unless one rents a boat for the purpose of visiting, the gated BBC it is more or less isolated from the rest of Guana Cay. Guana Cay's picturesque small settlement lies three miles south of Bakers Bay with, as mentioned, limited accessibility between the two. (Map). It follows the harbour side road where you'll find a couple souvenir shops, food store and liquor store. The settlement here makes one feel you are really on an "Out Island" unless you are caught in the foot traffic headed to Nippers along the road. 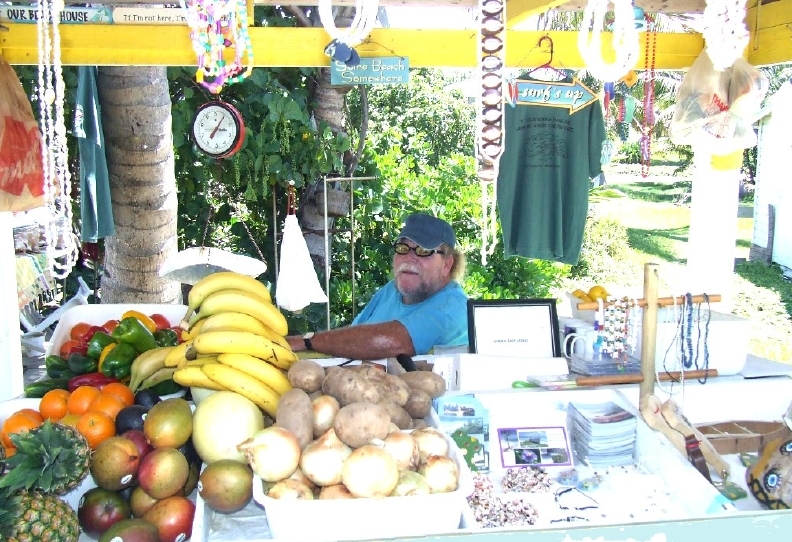 Along the way you will no doubt pass Milo's produce stand which has been at the same location for generations. Be sure to say hi on your walk. Furthure along you'll also notice the remains of the old fig tree surrounded by benches, the settlements version of the "town square" where local folks gather to chat and play dominos. 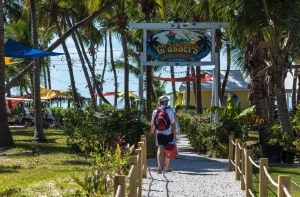 Midway on front street between Grabbers and Nippers is Kidd's Cove Bar and Seafood Restaurant making for a perfect pit stop when bar hopping on the island. Spotted at Kidd's recently was Kenny Chesney who often uses Abaco as the environs for his music videos. The settlement adjoins the Great Guana Resort property whose main building burnt down, and which was the premier resort on the island. The Guana Beach Resort which was the grand daddy of all resorts on Guana, was for all practical purposes, destroyed by Floyd and Fire. Despite that fact, their Sunset Bar at pool side was resurrected from the debris and is now called Grabbers, Light food is served and naturally the "Guana Grabber" the drink of choice. The original motel type cottages that remained have been renovated plus an additional five condo/apartments in place of the old hotel. All are available for rent. Grabbers is a popular spot especially with the cruising folks who anchor just off its beach in Fishers Bay. Of course there is Nippers, one of the hottest spots in all of Abaco (Video). It is a trendsetting place that lives up to its reputation and one of a few places that stays open in early fall. Often you find Johnny Nipper himself bar tending. (see food & drinks). It's on a bluff overlooking their snorkeling beach and ocean - Spectacular. It really packs them in. You can also dine in style at "Overso", Nippers new enclosed air conditioned restaurant. Chef Debbie also includes many state side favorites in her menu of local fare. As for home and villa rentals on Guana, they are numerous. Some are quite a trek from the settlement on this 5.5 mile long island. One rental, self described, "Our cottage is right in the settlement and I find it a lot of fun to hang out on our deck and meet new friends and see old ones", and that be Rick & Tina's Beach Walk Cottage. Also close to everything is Elaine and Mickey Hashem's lovely house with studio apartment. 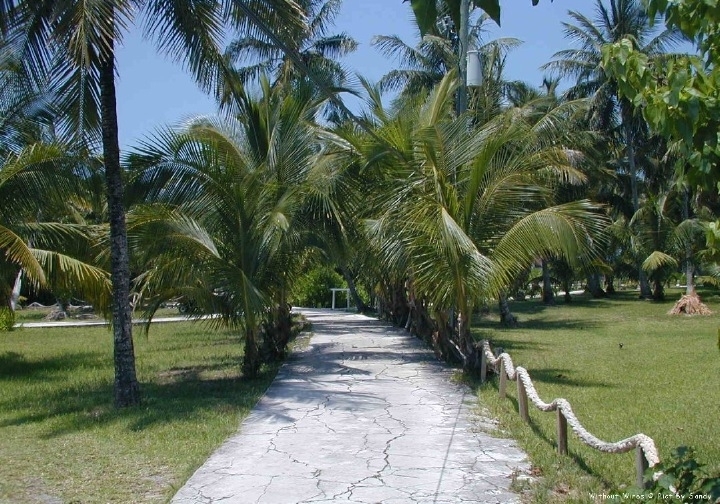 It’s on the south side of the settlement right on the water with unsurpassed view of the sea of Abaco. You can rent one or both. Info is here Abaco Sea Fan & Sea Biscuit. For a rental agency you might want to check out Guana Luxury Villas. For more Guana homes for rent, go to Sandy's Quick Links to Accommodations & Services. 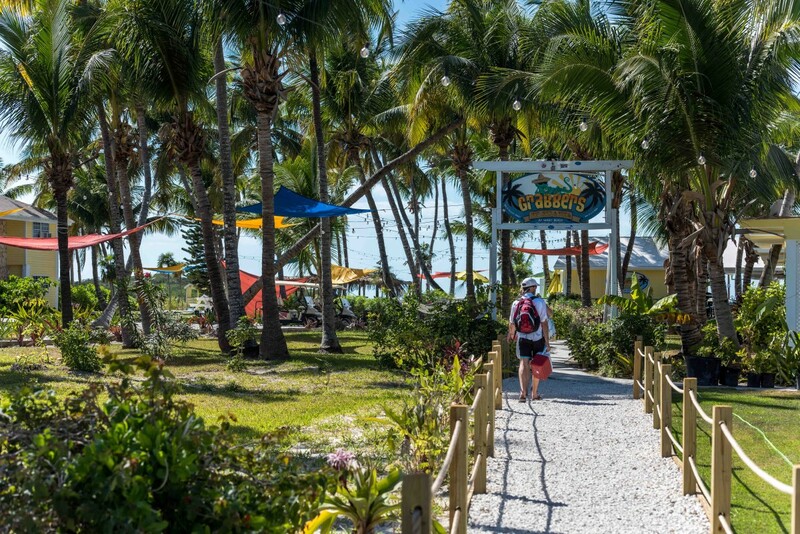 On Guana Cay you'll find another of Abaco's premiere dive shops, Dive Guana. Even if your not staying on the cay, the proprietor Troy will come pick your group up. Diving equipment may also be rented along with boats & golf carts. Troy also offers excursions to events elsewhere. Just stop by and ask. It's located in Settlement Harbor, right on front street.